This is a new guided walking tour starting from Krk City centre and following a newly marked walking path, some of it through olive groves. The 14 km route should take about 4 hours and the total time, including refreshment stops, will take approximately 5 hours. Participants will be provided with refreshments (water, dried figs, traditional pastries). A farmhouse lunch using Island of Krk products will be organized in the City of Krk upon the return. This new walking tour replaces last years' tour "Following the trail of asparagus" - why don't you come and join us? 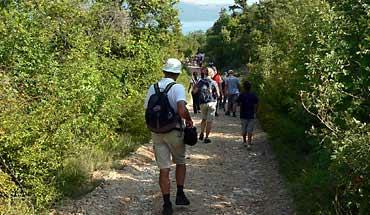 If you think you would enjoy a trekking holiday on the Island of Krk at some other time, do check our Trekking on Krk Island holiday package offer. Previous year - Walking tour "Following the trail of asparagus"
The weather was perfect, the day was exciting! More than 300 people have participated in this event searching for wild asparagus and enjoying the nature of Krk Island. We were walking through unpaved tracks, olive tree orchards, shepards' trails and paths along the coast, we used boat, we visited rural etno house and we returned to Krk quay to feast on the largest asparagus omelet ever made on Krk which used 1002 eggs (see for yourself on the video at approx. 3:40).